Have you met Libby? If you’re into eBooks & eAudiobooks, chances are you have – or that you will soon. Created by Overdrive, the Libby app is essentially an easier to use version of the Overdrive app. It contains all of the same titles Overdrive, and if you’re using Overdrive already your account information, checkouts, and holds will automatically transfer over into Libby. Libby is built and branded as a “One Tap App,” meaning that once you borrow a book it will automatically download and open; there’s no need to toggle back and forth between different bookshelves. People who have already switched over to Libby are complementing the simplified interface, as well as the speedier search, borrow, and download process. If you’re new to eBooks, we recommend Libby as a great place to get started; the signup process is easier than it is for the Overdtive App. If you are currently using Overdrive, are happy with it, and don’t want to switch over to Libby, the great thing is you don’t have to! The migration is completely voluntary, based on your preference. You can even use both Overdrive and Libby side by side if you want to; there’s no need to make a commitment wither way. Libby is available as a free download for Apple, Android, and Microsoft Devices. If you are transferring your books to a Kobo eReader, you will want to stick with Overdrive. 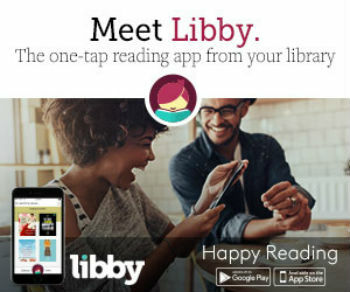 Once you have installed the Libby App you will need a library card to activate your account. If you have any questions, we’re always happy to help you out!